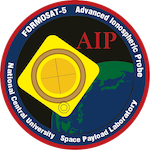 FORMOSAT-5 AIP SDC 福爾摩沙衛五號先進電離層探測儀科學資料中心：The SDC managed by SPL will be in charge of AIP operation and data processing. The level-0 science data are downloaded from FORMOSAT-5 satellite everyday and the level-1 science data will be available on 2019Q2. FORMOSAT-7C1 IVM 福爾摩沙衛七號第一組星系離子速度儀資料資料處理：The developed program can convert raw electrical current data to ionospheric ion concentrations, ion velocity in instrument coordinate, and ion temperature if sufficient documents and calibration data are provided by NSPO. Databases from Sounding Rocket experiments 探空火箭科學與姿態資料：The science data from SR-V/IP, SR-VII/PP, and SR-IX/SPSP and attitude information from SR-V, SR-VII, SR-VIII, SR-IX, and SR-X are archived in SPL. These are available on a special request. ROCSAT-1 IPEI SDDC (The official website led by Prof. S. -Y. Su was closed for computer security reason.) 中華衛星一號電離層電漿及電動效應儀科學資料分送中心：IPEI level-one data with 1-s time resolution are available in public. However, full-resolution data (32 Ni s-1 in NORMAL mode and 1,024 Ni s-1 in FAST mode) and average data/models could be available on request via SPL.